The aim of the project is to develop sustainable and attractive “gateways” to protected nature via sustainable environmental solutions and increased professionalism among harbour entrepreneurs. 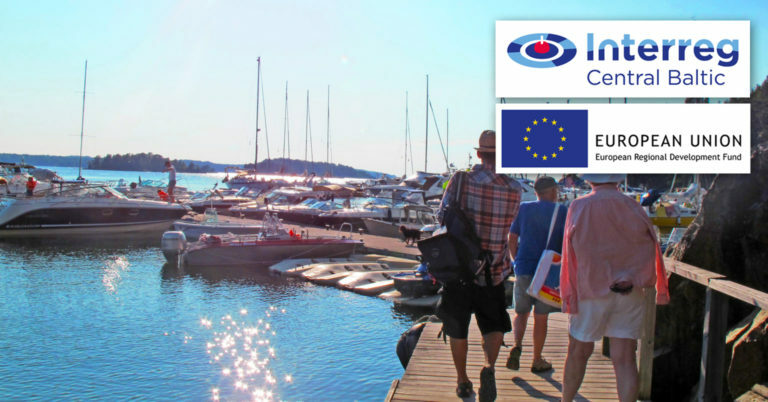 The result will be increased nature tourism that is directed to the guest harbours in order to protect the nature in Finland’s marine national parks and the nature reserves of the Stockholm archipelago. The harbours concerned in Sweden are Grinda, Utö and Nåttarö. Grinda is already well-visited and a new sewage works will be built here for the guest harbour’s service building. Some older jetties will be renovated and equipped with access ramps to make them safer for wheelchair users. Utö is a very popular island in the southern archipelago. Most visitors go to the northern part of the harbour, but in the peak season this is not sufficient for all the visiting pleasure boats. A service building will therefore be built in the southern part of the harbour for those who choose to moor there. Electrical hook-ups and Y booms on the floating jetties are other measures that will improve the experience for visitors. Nåttarö’s tour boat jetty currently only has a small number of berths for visiting boats. The Archipelago Foundation will increase the capacity here by setting up new floating jetties for about another 20 or so boats. A new service building for the guest harbour visitors will be built here as well. Work on the various improvements is beginning in spring 2018 and all measures are expected to be complete within two years. In Finland, the harbours Katanpää, Bodö, Örö and Jussarö will benefit from this project.